The book argues that the Creative City (with a capital 'C') is a systemic requirement of neoliberal capitalist urban development and part of the wider policy framework of ‘creativity’ that includes the creative industries and the creative class, and also has inequalities and injustices in-built. The book argues that the Creative City does stimulate creativity, but through a reaction to it, not as part of it. Creative City policies speak of having mechanisms to stimulate individual, collective or civic creativity, yet through a theoretical exploration of urban subversion, the book argues that to be 'truly' creative is to be radically different from those creative practices that the Creative City caters for. 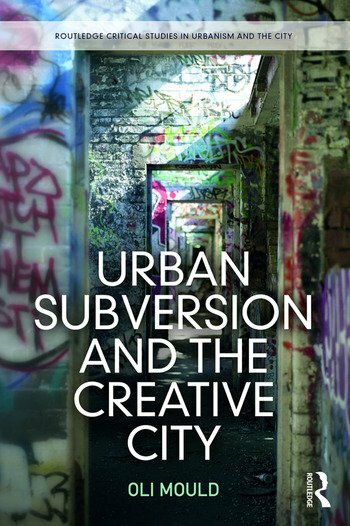 Moreover, the book analyses the role that urban subversion and subcultures have in the contemporary city in challenging the dominant political economic hegemony of urban creativity. Creative activities of people from cities all over the world are discussed and critically analysed to highlight how urban creativity has become co-opted for political and economic goals, but through a radical reconceptualisation of what creativity is that includes urban subversion, we can begin to realise a creative city (with a small 'c'). Oli Mould is Lecturer in Human Geography at Royal Holloway, University of London.